One of the best ways to enjoy music with children is through synchronized movements. Movements like dancing and clapping. Moving to a beat in time with another person may even help build interpersonal relationships. Research demonstrates that moving together can play an important role in how we create emotional bonds with one another. 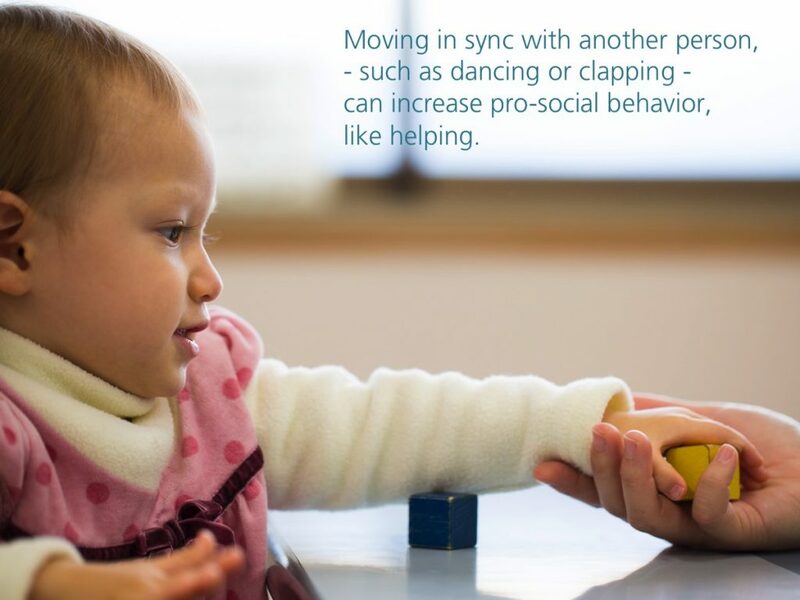 Movement and synchrony inspires infants and children to behave socially toward other people. In one study, a group of 14-month-old infants was bounced in synchronized motions with an experimenter for two minutes to music. Another group was bounced out of sync with the experimenter. After the bouncing, infants were placed in a room with the experimenter. The experimenter pretended to drop a clothespin and mimed being unable to pick it up. Infants who were bounced in sync with the experimenter were more likely to try to help them pick up the pin. Infants who were bounced out of sync were less likely to try and help. Attempting to help another person is a type of pro-social behavior. The infants’ desire to help the experimenter demonstrates a powerful effect of moving in sync with another person.